This are the results of the final assignment of the module Game Graphics (next year called Game Art 1) in the second year. The students had to make one old building and texture it using hand painted techniques, using Photoshop or 3D-Coat. The timeframe for this assignment was to limited to incorporate normal mapping or sculpting. The results were published on Sketchfab, where many students received praise from the community and a Sketchfab staff pick! Well done to the students, and give them another like! 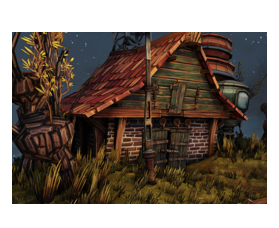 <update> Sander Vander Meiren was asked by Sketchfab to write an article about his scene, how cool is that, read it here. Rik van den Biggelaar even wrote an article about his work on the Sketchfab website.